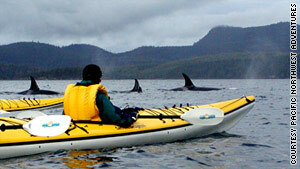 Kayakers may see pods of orcas in British Columbia's Johnstone Strait. (Travel + Leisure) -- The changing leaves are just one lure for outdoor adventurers during the fall season. The tourist crowds of July and August have dissipated, and in many spots, the blistering summer heat has passed. And happily, an abundance of premier tour operators offer ready-made autumn adventures that are relatively easy on the wallet. They bring expert guides and top-quality gear and arrange all meals and accommodations -- you just bring your thirst for adventure. British Columbia's Johnstone Strait, a glacier-carved channel between the mainland and Vancouver Island, offers intrepid sea kayakers a chance to get up close and personal with killer whales. Surrounded by the glaciated peaks of the Coastal Range, you'll witness pods of orcas feeding on the annual salmon runs, which go only through October. Other likely animal sightings: humpback whales, Pacific white-sided dolphins, Dall's porpoises, minke whales, even black bears and grizzlies. You'll also take short hikes in the mountainous Pacific rainforest from your beach camp at Spyhop Point, a quiet spot with roomy tents under towering hemlock and Sitka spruce trees. This bike trip takes you inn-hopping in classic New England, past farmlands on country roads, in a valley between the Green Mountains and the Adirondacks. Trip leader Gerry Slager has lived in Vermont for 30 years; he guides leisurely excursions on the shoreline of Lake Champlain and along paths that wind in and around the lake's islands, with time out to kayak, explore walking trails, or simply take in the spectacular fall colors. You'll stop by the Shelburne Museum of art and Americana, as well as the Morgan Horse Farm and the college town of Middlebury, where you'll visit a workshop and store run by a fifth-generation pewtersmith. Cost: $1,395--$1,745 double occupancy, six days. Lead guide Grant Johnson, who has lived in the area since 1975, is passionate about the area's geologic formations and the history of the prehistoric cultures. On his Kayenta Passages trip, you set up base camp on a sandy beach by the Escalante River and from there take day trips into the surrounding canyons and the serpentine passages between them. Canyons are particularly lush in the fall, filled with cottonwood trees and flowers like purple aster and orange globe mallow. You'll walk the benches and mesas above the canyons in the cool fall mornings and wade in the river in the afternoons; in between you'll climb Anasazi trails, passing by prehistoric rock art on the canyon walls. Cost: $1,420 single or double occupancy, five days. Southern Baja's Espiritu Santo Island, in the Sea of Cortez, is known as the Mexican Galápagos for its abundance of marine life, from dolphins to manta rays. And the Espiritu Santo Island Circumnavigation trip offers a chance to sea kayak, snorkel, and camp on the island's sparkling beaches. Go in fall and you'll avoid summer's heat and winter's strong winds; it's also a time when the Baja desert is blooming and the water is warm and clear -- just right for snorkeling. Between excursions you'll hike through canyons and boulder up arroyos, surrounded by cacti, hanging fig trees, and Baja "lace" -- where pink volcanic ash drips from the cliffs. At Los Islotes, a sea lion rookery, travelers get to swim alongside the local inhabitants. Cost: $1,150 double occupancy, eight days. The colorful slopes of the Great Smokies provide a great setting for a hut-to-hut trek. You hike between 8 and 12 miles a day, ascending between 1,500 and 2,000 feet while learning about backpacking skills, edible plants, and the rainforest ecosystem. Starting in Gatlinburg, you follow the Appalachian Trail up Clingmans Dome, then ridge-walk through hardwood forests and rocky balds (treeless mountaintops) en route to Derrick Knob. A series of steep hills and descents leads to the three peaks of Thunderhead Mountain. The last leg brings you to a shelter in a mountain meadow. Cost: $625 per person for REI members, $670 non-members ($20 buys you a lifetime membership), four days. The Great Plains are all about big skies and bison. And on this trip you'll experience both. You'll cycle south from Rapid City across the Mickelson Trail's converted railroad bed, explore Mount Rushmore and Crazy Horse monument, then head to Custer State Park, where the towering granite spires and grasslands are a refuge for 1,500 bison. The fall frequently brings wonderful Indian summer weather, plus it's breeding season, so you can expect to see some very active wildlife. After some time unwinding at the State Game Lodge, you bike into ranch country, stopping to explore Wind Cave National Park's labyrinthine underground mazes or get a massage at the Red Rock River Resort & Spa. Cost: $1,998 double occupancy, six days. Your base for the "Sea Kayak and Snorkel the Florida Keys and Dry Tortugas" trip is, fittingly, an island beach house in the Gulf of Mexico. Kayak through mangrove tunnels in a bird-filled park, visit Key West for Fantasy Fest (a Halloween festival that rivals Mardi Gras), and snorkel among orange and yellow coral, purple sea fans, and parrot fish. You'll also visit Dry Tortugas National Park, a cluster of coral reef islands and sand banks 60 miles west of Key West. Best of all, the fall departure comes at the tail end of hurricane season, when the weather's cooler and the crowds are gone. Cost: $1,795 per person, seven days. Hike and bike in the driest, lowest, and hottest place in North America. In October, the blazing summer heat has subsided, but daytime highs still hover between 80 and 90 degrees. You'll set up at the Furnace Creek Inn, a Mission Revival-style hotel between the Funeral Mountains and the desert salt pan that has a spring-fed swimming pool, horse stables, and golf. From there, geology expert Mike Flaherty leads bikers into the surreal valley, past the haystack-like arrow weed of Devil's Cornfield and into the dunes, stopping at freshwater springs. You'll also hike Zabriskie Point, overlooking the Panamint Range and a golden maze of rock formations, and visit Badwater, which at 282 feet below sea level is the lowest elevation in the U.S. Cost: $1,898 double occupancy, four days. This trip takes bicyclists along Nova Scotia's south shore, starting on the Aspotogan Peninsula. You'll stop at Mahone Bay, with its steeples and colorful houses, and Lunenberg, a British colonial settlement and fishing/shipbuilding hub that's now a UNESCO heritage site. You're often riding between the water and the woods, with great views of the ocean and colorful trees. Each day you visit a lighthouse, ending up at country inns every night. Cost: $1,795 double occupancy, six days. Autumn brings crisp, sunny weather to the thickly forested high country of the Gila Wilderness. And you'll appreciate the cool breezes, as this is a strenuous trip: while you don't scale peaks every day, you consistently maintain an altitude of 7,500 to 10,000 feet. Along the way you see massive oaks and aspens amid the towering evergreens of pine, spruce, and Douglas fir. You'll keep an eye out for elk, wild turkey, and Mexican gray wolves among the mountain streams and plunging rocky canyons, spending nights curled up in top-quality lightweight tents. Cost: $1,800 per person ($200 discount if you bring your own gear), seven days.